As you know, Russia supplies Gas to many European countries. 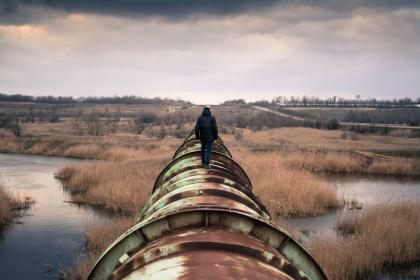 Do you know what’s in your critical data pipelines? So what? What else would one expect? Applied common sense… yes? Why is it that such common sense is often lacking in Data Migration and Data Population projects? Why do some Enterprises continue to perform data population of, and ongoing data entry to, critical data repositories without fully understanding the data they are pumping into the repository? Performing data population on the basis of what the source data “should contain”, without analysing what exactly it does contain is known as ‘Load and Explode’ approach to Data Population. I cover this Enterprise Wide Data Issue in more detail here. We in the “Data Governance”, “Data Quality” industry need to educate the business community on the “common sense” parts of data governance, and the need to engage “Data Governance Professionals” to ensure that “Data Quality Common Sense” is actually applied. This entry was posted in AML, Anti Money Laundering, Data Analysis, Data Governance, Data Profiling, Data Quality, Load and Explode, MDM and tagged AML, Anti Money Laundering, CRM, Customer Relationship Management, Data Analysis, Data Governance, Data Migration, Data Population, Data Profiling, Data Quality, ETL, Extract Transform Load, know your customer, Load and Explode, Master Data Management. Bookmark the permalink. Very true. This is especially prevalent in companies with ‘bespoke’ IT development houses. We as the Data Governance folk need to ensure that we are part of every conversation concerning development and changes / additions to enterprise data models. We need to educate IT to the point that they think about data consumption rather than how quickly data can be produced. IT needs to be involved in understanding the entire data life-cycle and downstream business processes and data consumers.